1. Prepare the zoodles, see prep tip below. Place zoodles in a microwave-safe bowl and cook in microwave for about 2 minutes, until softened. 2. In the meantime, in a large nonstick pan, heat butter over medium-low heat. Add garlic and crushed red pepper flakes and cook for 1 minute, stirring constantly. 3. Add shrimp to pan and cook, stirring often, until they are cooked throughout and pink on all sides, about 2 minutes. Season shrimp with a little salt and pepper. Using a slotted spoon, transfer them to a bowl, leaving any liquid in the pan. 4. Increase heat to medium. To the same pan, add white wine and lemon juice. Using a wooden spoon or rubber spatula, scrape any brown bits from the bottom of the pan, cooking the wine and lemon juice for 2 minutes. Add the softened zucchini noodles and cooked shrimp. Toss to combine and heat about 30 seconds. 5. Divide the zoodles among 2 plates and spread out over plate. Top each with 6 shrimp. Sprinkle each serving with 1 teaspoon Parmesan cheese. Makes 2 servings. Each serving 6 shrimp and ½ the zoodles. 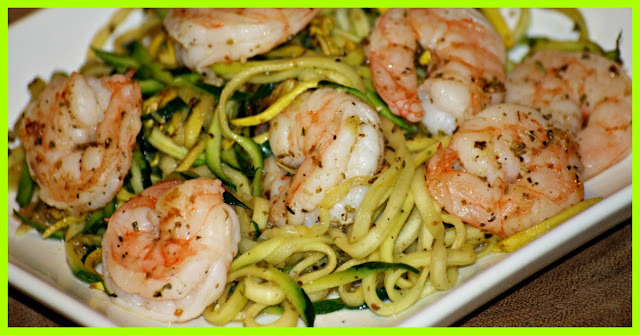 for 1 serving, 6 shrimp and ½ of the zoodles.